Did you know that nvm supports a list of default global packages to include when installing a new node version? Personally, I use this to make sure gulp-cli is installed in new node versions. At Intouch Insight our logging infrastructure is our holy grail. The engineering team relies on it every day, so we need to keep it up to snuff. 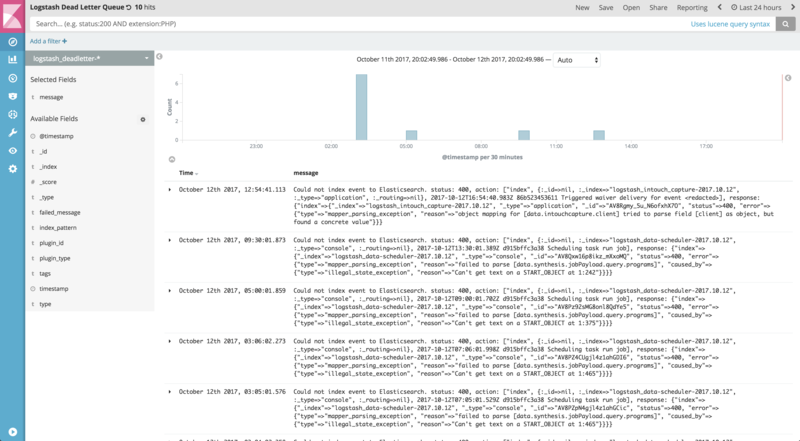 I was lucky enough to be able to update our ELK cluster this week to 5.6 - a huge upgrade from our previous stack running ES 2.3 and Kibana 4. One of the features I was most looking forward to was the dead letter queue that was introduced in Logstash 5.5. The documentation surrounding the usage of the dead letter queue mostly revolves around re-processing rejected events. I wasn’t particularly interested in that use case; I just wanted to be able to easily see when events were rejected. # just created. Note that this does not prune event metadata. # date filter. Before conversion, this field is a Logstash::Timestamp. # Apply the date filter. # letter queue, and add it to the new event. I’d love to rewrite this as a codec that could be applied to the input, but that’s currently not possible as the dead_letter_queue input plugin doesn’t make any calls to the codec specified in it’s config. If you have an issue with a given primary, Aurora may promote another instance to your WRITER role. If you need to perform an in-place update, you can sometimes do so by creating a new set of instances, and promoting those manually. In either case, you’ll either lose your alarms completely, if you forget to re-create them, or your alarms for your primary instance will no longer be on your primary. It turns out that the metrics Aurora publishes also include DBClusterIdentifier and Role dimensions. If you choose that dimension group, then you can view metrics and set alarms based on the WRITER or READER roles, for whatever cluster you desire. This is much more fool-proof than setting alarms per-instance. Laravel is a great framework; it’s easy to use and extend, and makes liberal use of Interfaces so that you can write your own implementations and provide them to the IoC Container. Unfortunately, the downside to this is navigability. Many times, your IDE detects that a variable has either been type hinted, or has code comments indicating that it is storing a particular Interface, rather than a concrete class, and this sometimes makes navigation difficult. Allow me to introduce you to Go to Implementation (CMD-OPT-B) in PHPStorm - just one additional key press away from the most commonly used Go to Declaration (CMD-B) It’ll allow you to select a specific implementation of whatever abstract method you’ve got a reference to. We all have those moments when Queue jobs fail. Sometimes it’s a bad deploy, others it’s an upstream service that’s taken a poop. Sometimes, we need to retry failed jobs, but can’t just artisan queue retry:all, because maybe we haven’t done a cleanup of failed jobs lately. What happens when you know the file name, but perhaps not the full prefix (path) of the file? I hit this in production today, which is the motive of the blog post. The next question is what I thought might be a useful example, when I wanted to extrapolate what I’d learned to other use cases. How do you find files modified on specific dates, regardless of prefix? We run Elasticsearch in production, fronted by an API which abstracts away complex queries and presents our APIs which consume the data a consistent interface. It came to my attention recently that we had no visibility in NewRelic on external transaction time going to ES. In a nutshell, the problem turned out to be that the elasticsearch-php-sdk uses RingPHP as a transport, which NewRelic doesn’t support. I’ve written a RingPHP Guzzle Adapter which the user can pass to elasticsearch and quickly gain instrumentation. 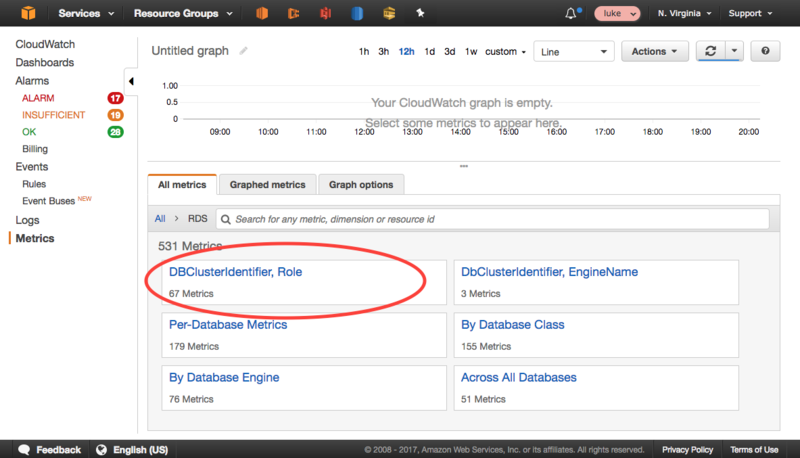 We’ve seen occasionally poor performance on the AWS EC2 Metadata API when using IAM roles at Intouch which got me thinking. 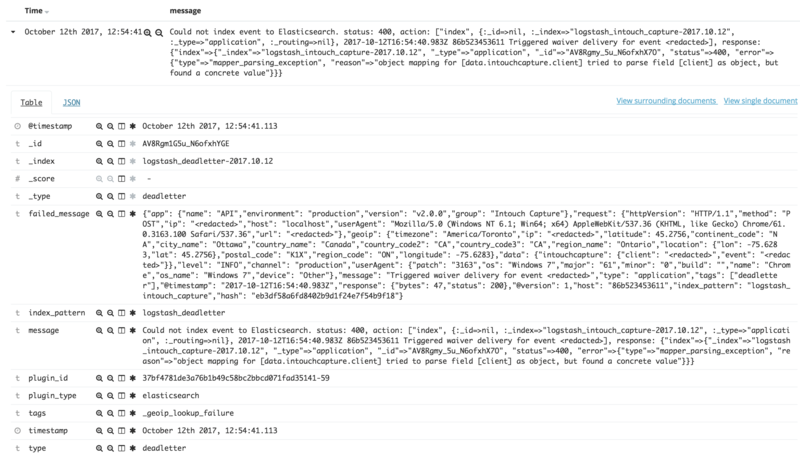 Why does the aws-pdp-sdk need to hit the EC2 Metadata API during every request? Well, it turns out, it’s simple. If you don’t explicitly give the sdk a cache interface, then it won’t use one! I’ve just published the initial release of my laravel-aws-cache-adapter plugin on packagist. Following up my previous post about the release of my laravel-queue-aws-batch plugin, I am pleased to announce that I have tagged two stable versions for release. npm ERR! git fetch -a origin (ssh://[email protected]/group/project.git) fatal: Could not read from remote repository. npm ERR! git fetch -a origin (ssh://[email protected]/group/project.git) and the repository exists. In our particular use case, we’d just passed the threshold of having more than 10 internally sourced NPM dependencies, being sourced by tag directly from our GitLab server. The solution is updating quite a simple SSH setting; MaxStartups. Here’s the man page entry from sshd_config. Yes - sshd will throttle your concurrent connections while they authenticate. Increasing MaxStartups caused our npm installation woes to disappear from our CI environment. Huzzah! I’ve been using the ELK stack for over three years. It’s a tool that is used daily at work, so it’s little surprise that when In-Touch Insight Systems went down the AWS Lambda road for one of our newest projects, I wasn’t happy using the default CloudWatch Logs UI. Initial setup of OpsWorks instances takes between 15 and 25 minutes depending on the complexity of your chef recipes. The OpsWorks startup process injects a sequence of updates and package installations via the instance userdata before setup can run. To make matters worse, the default Ubuntu 14.04 AMI provided by AWS (at the time of writing) over six months old! YMMV but I experienced a 11 minute speedup simply in “time to running_setup” by introducing a simple custom AMI.